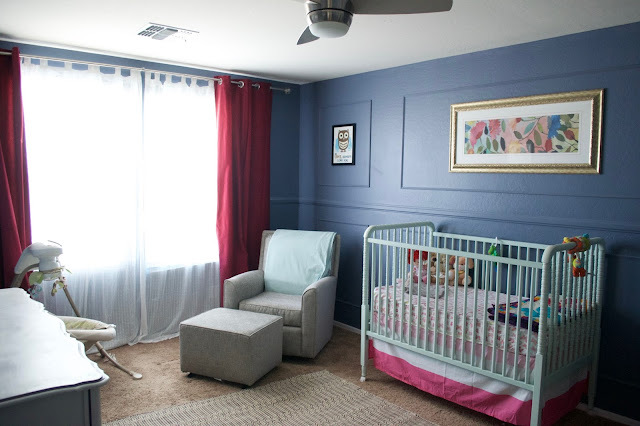 CK and Nate header: Maisie's Room - All Done Up! 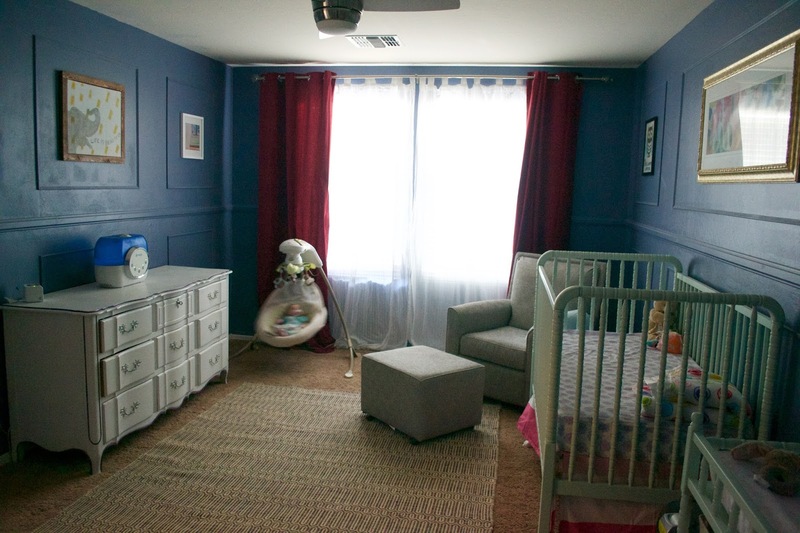 Maisie's Room - All Done Up! There are some times when I finish a room and there are things I'm so-so on. Then there are times when, even after awhile, I can't get over how much I love the space. That's how I feel about Maisie's nursery. 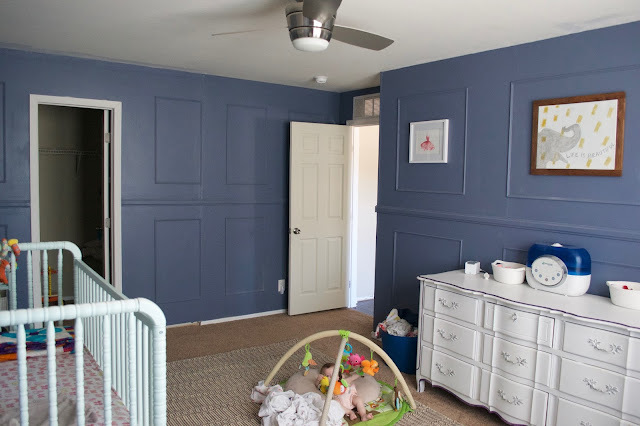 It took a lot to (literally) build the room, which you can read about here, and once we finished our new master enough to move out of her room, I could finally get around to finishing it for her. I picked up a Jenny Lind crib and changing table for a steal off of Craigslist. We did have to retrofit the crib so that it doesn't have a moveable side, which was fairly easy... just required some L brackets and drilling. 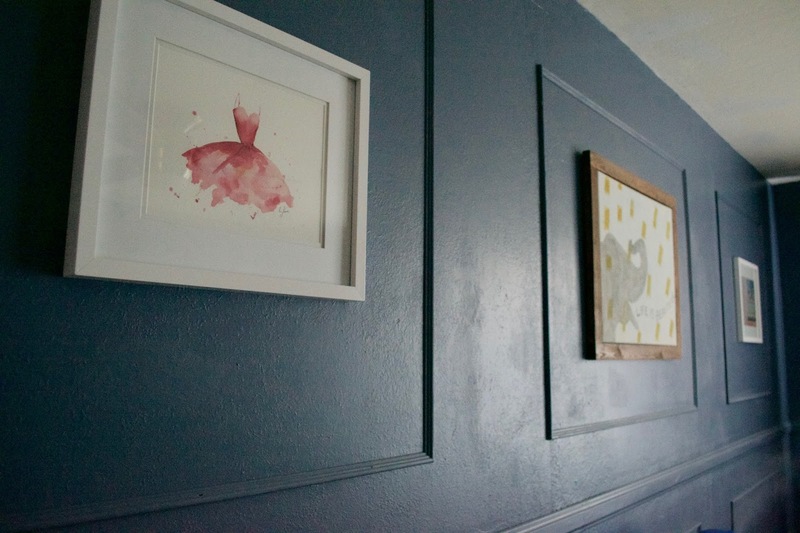 We then sprayed both of them a soft mint green, which I love against the dark walls. The art in Maisie's room is a smattering of handmade items, pieces that were given to us, and items I've picked up over the years that pulled the accent colors of the room. I used the moulding that I installed to frame each piece. The dresser is a piece we picked up in a consignment shop in Florida and the rug is a transplant from Will's playroom in the FL house. The curtains are from Ikea. The big splurge in this room was the glider. I didn't have one with Will and it was on the top of my list of things I wanted this go around. It was totally worth every penny and it's by far my favorite seat in the house (which it kinda has to be since I sat in a crazy number of them to find this one). We got it at BuyBuyBaby and it's the "Blake" glider from Little Castle. It's not too squishy and it has angled arms so it's pretty awesome when feeding Maisie. I even sometimes hang out in here after Maisie goes down or have her play on the floor while I work in this chair just to spend a little more time in it. So this is where we chill with Maisie now. 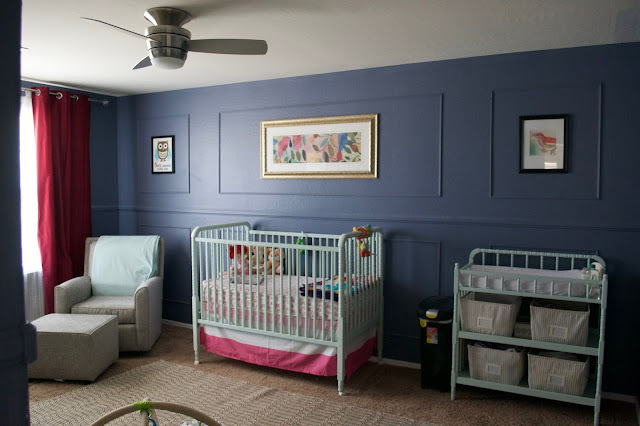 I know dark walls aren't super nursery-esq, but I wanted an untraditional nursery for her and it actually works really well since this girl needs a DARK room to sleep. It's also girly without being super pink. My favorite part is still the trim work that I spent way too many hours on. What's your favorite part?